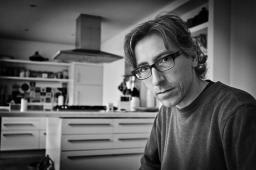 David Trueba is a writer and film director. He is the author of three novels, all of them widely translated: Abierto toda la noche (Anagrama, 1995), Cuatro amigos (Anagrama, 1999) a best (and long) seller with more than 20 reprints, and Saber Perder (Anagrama, 2008; Spanish National Critics Prize 2008, shortlisted for the Dulce Chacón Award 2009 and the Prix Médicis Étranger 2010). His film, Vivir es fácil con los ojos cerrados, that he wrote and directed, was a smash hit with audiences, going on to scoop an array of prizes and honors, among them being longlisted for the Oscars 2015 in the Best Foreign Film category and winning the Goya Awards (the Spanish equivalent to the Oscars) for Best Film, Best Director and Best Original Screenplay. After the novel Blitz (Anagrama, 2015), an instant bestseller, he was published the eagerly awaited novel Tierra de campos (Anagrama, 2017). His last work is a no-fiction book La tiranía sin tiranos (Nuevos cuadernos Anagrama, 2018).